I can appreciate formulating career coaches and working to place individuals with needs, but I need to ask how are we building a world for this dude? I hear a lot about working on skills like – know what to wear to work, how do you check your schedule, having a conversation with your coworkers, you know the coveted “soft skills”. BUT, I ask you where is Noah’s place in this employment conversation? He has limited verbal communication, might have some aggression or other barriers, so can he access independent work or supported employment. I would support the sugar out of his employment, but what happens when he doesn’t have a 1:1 support person? How do we open the conversation and world of employment to those who will need more of us? Listen, there are people and companies who are absolutely doing this, but I want us all to start thinking about if we want to include and provide opportunities they must include opportunities for dudes like Noah. Our sons and daughters have much to add and it will take creativity, grit and a more than just a touch of hard work to expand places for them. I by no means am I minimize the effort and work that has or currently is being done. I am just wanting our kids who don’t have voices to have one during the conversation. Conversations over the past few weeks helped crystalize the vision of what a day could look like for Noah it was both empowering and terrifying at the same time. Here is the deal in a unicorn filled world with rainbows and kittens he would be 100% independent with no safety issues and work a full-time job. However, in our reality soaked world he needs 24/7 supervision and maybe he won’t be working a “typical” job full time. So that is why we are building and working like mad to figure out options for him before the cliff comes at 21. 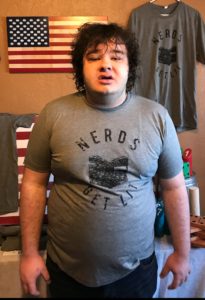 We are not unique or special we have fought so hard for basic services for him as a youth adulthood is hitting us like a 21 year old freight train. I could complain and bemoan that we shouldn’t have to build something or there should be world-class services, but what good would that do? Would that make it so? Of course it wouldn’t. Here is the deal folks until we start to put funding behind the programs and people we say we value the gaps will continue. What we are working on inch by inch is to have a place where Noah can get a few hours in, but if needed can also hang until the work day ends. Yes, I said that I am trying to build a place that isn’t only about work, but safety, community and hope. I am sure I am not alone with sleepless nights worrying about do we send him to day habilitation, hire someone with our millions (fyi we don’t have millions), or can we provide a hybrid model that allows him to be valued, secure and maybe just maybe reduce the stress load on caregivers. I love watching people working on better solutions for our peeps, you can find some of them highlighted on our Facebook page or blogs. Warrior on folks, and Let Joy Be Your Currency! ← Who Has Two Thumbs and Is The Worst?